Genocide denial. Criminal when non-Muslims do it, tolerated even venerated when Muslims do it. So it stands to reason that the Armenian genocide of millions of Christians by Muslims has not been designated as such by so many Western countries. 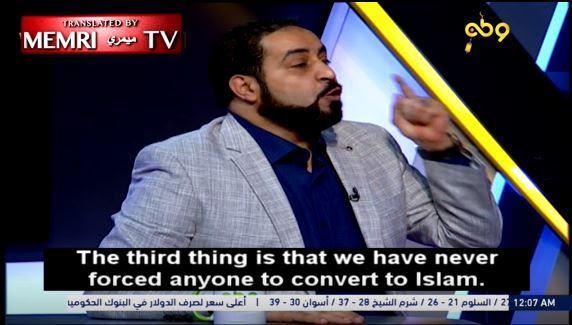 Egyptian cleric Sheikh Sharif Abadi said that throughout history, the Muslims never fought peoples, never conquered in order to collect the jizya poll tax, never forced people to convert to Islam, and never perpetrated a racial massacre. 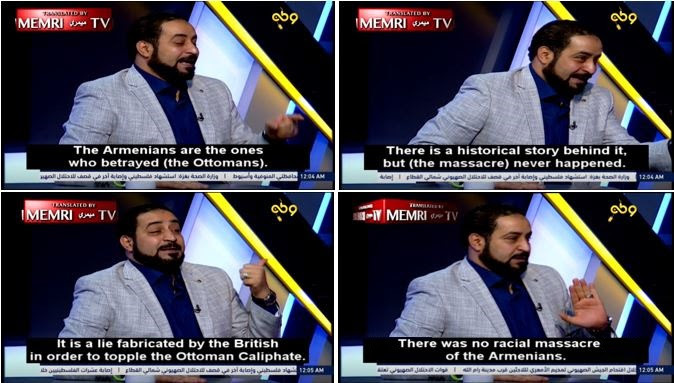 According to Sheikh Abadi, the Armenian massacre was “a lie fabricated by the British in order to topple the Ottoman Caliphate.” He further said that when the Jews were banished from England, they came to the Ottoman Empire. “If we really wanted to kill them all, we would have done it then,” he said. The interview with Sheikh Abadi aired on May 28 on the Egyptian Muslim Brotherhood Watan TV channel, which broadcasts from Turkey. Sharif Abadi: “First of all, we never fought peoples. Whoever says that we conquered in order to collect the jizya poll tax is lying. We have never fought any people. Sharif Abadi: “It was the Byzantines who started the fight in the Battle of Mu’tah. Sharif Abadi: “When the emperor fell, did we fight the people or did we let them be? We fought the emperor and his brutal soldiers, but did we force people [to convert] after we won? Sharif Abadi: “The Armenians are the ones who betrayed [the Ottomans]. There is a historical story behind it, but [the massacre] never happened. It is a lie fabricated by the British in order to topple the Ottoman Caliphate. Are you saying that we had refrained from perpetrating racial massacres for 14 centuries, just to carry one out in the final two years of the Caliphate? Does this even make sense? It’s a lie. There was no racial massacre of the Armenians. They are the ones who started it. They are the ones who betrayed us. They are the ones who killed Muslims and burned mosques. Sharif Abadi: “They came to us, to the Ottoman Empire. If we really wanted to kill them all, we would have done it then, right? Have we ever massacred Christians? Have we ever massacred the Amazigh, the Berbers, anyone? We have never perpetrated a racial massacre or killed women and children.